The panels were designed in 1950 for their beauty – wooden panels wrapped in velvet of regal Roman red. The rich fabric offset the detail of the finds – the patina of metal coins, the marks of the worked stones, the delicacy of the glass. Each Roman artefact found by John Clayton was grouped, numbered, pinned to a corresponding red panel and put on display at Chesters Museum. They must have looked impressive when they were first installed. But that began to fade almost immediately. The velvet was not lightfast. Not archival. The Northumberland sun began to bleach them everywhere an artefact was not. After 38 years of exposure to the light, the only original red pigment remaining is in the shapes of the artefacts. They have become cameraless photographs. I will be displaying the collection of panels at Vane Gallery Newcastle in June 2015 along with a set of prints I am creating from my own archive. The panels had remained in the back cupboard of the Corbridge archive for nearly thirty years. In that time they became covered in light dappling of mould. Conservationist Karen Barker set about the task of conserving them for this project. It was an interesting prospect for her as I wanted no other marks of time or use removed, just the mould. She found traces of bone and copper corrosion from the artefacts on the panels and pins still present. In her time as conservator for English Heritage, she had seen some of the artefacts that had once rested against the panels – conserving them as they were marked with corrosion and traces of red velvet fibres. There are more objects in the archive that bare microscopic remnants of the velvet. 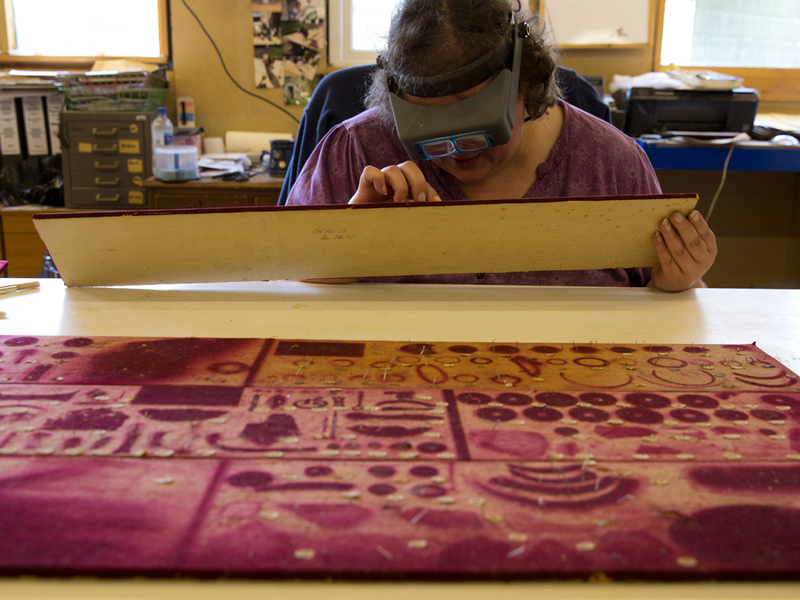 Karen conserved the panels removing visible mould spores and neutralising what remained on a microscopic level. Her conservation notes will be presented alongside the panels at Vane gallery as part of a talk at 6pm July 8th.